Hitherto some measurement methods and instruments were studied in the previous chapters. These instruments will indicate the quantity under measurement. They do not give any information pertaining to the waveform or shape of the signal under study. It is not only necessary to know the quantity but also to know the nature of variation of the quantity over a period of time. This requires a plot of the quantity over the required time interval. Preparing such a plot consumes lot of time, and some approximations have to be made. CRO is basically a very fast X-Y plotter. It gives a visual display of the variation of the input signal versus another signal or versus the time. It is an instrument that is extremely used for measurement and analysis of waveforms and other phenomena in the field of electronics. An electron beam produced by the cathode is made to give a luminous spot on the screen of the C.R.O. This spot can be made to move in accordance with the signal variation, giving us a visual pattern. Cathode Ray Oscilloscopes are useful not only in offering visual response of the voltage, but are also useful in presenting visual representations' of many other phenomenon by means of transducers. For example transducers can be used to convert strain, pressure, temperature and certain other physical quantities that can be represented on a C.R.O. Cathode Ray Oscilloscopes are used to investigate waveforms, transient happenings and other time-varying quantities. C.R.O.s have their frequency range from low frequencies to very high frequencies. The modification of the C.R.Tube gave picture tube for the television. C.R.O.s have been developed that can store the pattern over long periods and offer digital display (digital read out) of the signal under consideration. 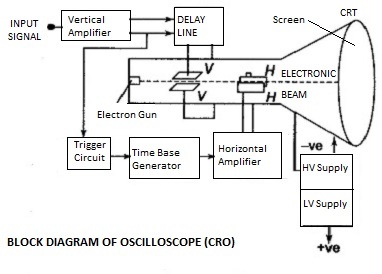 A Cathode Ray Oscilloscope is having its utilisation extended to several fields of Engineering, Communication, and Medical Electronics. The principles of operation of the C.R.O. are described in this chapter. The heart of the cathode ray oscilloscope is the CR Tube. It is the one that produces the visual pattern on its screen. As seen from the block diagram an electron gun assembly produces a sharp beam of electrons which is accelerated and made to strike a fluorescent screen. On the other side of this screen a small visual spot is produced. In its journey from the electron gun the electron beam passes through a pair of vertical deflecting plates and another pair of horizontal deflecting plates. The vertical deflecting plates move the beam vertically up and down. The horizontal deflecting plates move the beam the side ways. They are independently operated by application of voltages to the corresponding plates with required polarities. By properly applying the potentials on the deflecting plates the electron beam can be made to move to any part of the fluorescent screen. The signal whose waveform is to be analysed is given to the vertical input terminals of the CRO. An amplifier called the vertical amplifier amplifies the input signal. The output in the push-pull form is applied to the vertical deflecting plates, via the delay line. The gain of the vertical amplifier can be adjusted such that sufficient drive voltage is obtained at the deflecting plates. An attenuator is provided for this purpose which is calibrated in volts/division. The time base generator or sweep generator produces a sawtooth wave-form. The rate of this waveform is controlled by a control on the front panel of the CRO marked time/div. The time base generators output is amplified in an amplifier called the horizontal amplifier and is given to the horizontal deflecting plates in push-pull form. Application of the voltage to the horizontal deflecting plates makes the spot on the screen to execute motion from left to right. The trigger circuit controls the instants at which the sweep voltage is to be applied to the horizontal deflecting plates. There are two power supply stages. One is called the EHT extra high tension supply, that supplies the electrodes of the CRT. The other power supply called the low tension supply is meant for supplying the other devices used in the CRO. When the input signal is applied to the vertical deflecting plates and the sweep generators output is applied to the horizontal deflecting plates the electron beam (spot on screen) traces a path on the screen of the CRO, which represents the variation of the input signal with respect to time. Let us assume that the vertical deflecting plates are supplied with an alternating voltage. The vertical deflecting plates Y and Y', alternately become positive with respect to one another. If in one positive half cycle of the input signal we assume that Y is ,becoming positive w.r.t. Y', then the spot moves vertically up towards Y and reaches a place to close to Y depending on the amplitude of the voltage applied between the plates. As the amplitude of the input voltage decreases in that positive half cycle, the spot travels down towards the centre of the screen. In the next half cycle Y' becomes positive with respect to Y. Hence the spot will travel towards Y' vertically down. As the applied voltage is alternating the spot executes this movement from centre of the screen vertically up and down. The rate at which the spot moves in this path is dependent on the frequency of the input signal. If the Frequency is beyond the persistence of vision, we will not be able to see the spot in different Positions but we will see only a vertical line. The phosphorescence of the material coated on the screen aids the phenomenon of persistence of vision in this case. The height of the line seen low represents the peak to peak amplitude of the applied signal. Knowing the input volts required to deflect the beam or spot by a division on the graticule, V/div, we can estimate the magnitude of the input voltage. Similar explanation can be given when alternating voltage is applied to the horizontal deflecting plates alone. We obtain a horizontal line on the screen. The main intension is to display the waveform of the signal voltage applied to the vertical input terminals. This requires a linear increase in the voltage applied to the horizontal deflecting plates that sweeps the beam along the horizontal (time axis). It is also important that the horizontal sweep must be withdrawn when the beam is swept over a horizontal distance, such that the beam starts retracing the path again and again under the influence of the linearly increasing voltage. It is now clear that the horizontal deflecting plates require a saw-tooth waveform to sweep the beam repeatedly along the horizontal. The electron beam will be under the influence of two forces in this case, one the vertical deflecting plate voltage, and the other is the sweep voltage of the horizontal deflecting plates. From the above figure we observe that the vertical deflecting plates are supplied with an alternating voltage of sinusoidal nature. The horizontal deflecting plates are applied with the sweep voltage. At the instant 0, both the voltages are zero. Hence the beam has no deflecting forces acting on it. At the instant 1, the vertical input voltage is at its maximum and the sweep voltage has some amplitude. So the beam will be under the influence of the two deflecting forces and will move in the resultant direction and occupies a position 1 as shown in the figure, over the screen. It can be observed that the beam has been swept both vertically and horizontally following the resultant motion under the two deflecting forces. At the instant 2, the vertical deflecting force is 0, but the horizontal deflecting force is present. The vertical deflecting force has decreased to 0 from instant 1 of maximum voltage. Hence the vertical deflecting force being gradually withdrawn and the horizontal deflecting force increasing linearly the beam will move over to position 2 on the screen. The same process repeats till the two cycles of the input are completed. At this instant the horizontal deflecting voltage, the sweep voltage, completes its one cycle, hence the voltage falls abruptly to zero. Also at this instant the vertical deflecting voltage is zero. Hence the spot reaches the initial position. In the subsequent cycles of the vertical signal, and the sweep signal, the spot repeats tracing the path depending on the frequency of the sweep voltage. If the sweep frequency is beyond the persistence of vision, and if the frequency is constant, the spot commences the trace at the same point in each cycle, repeats tracing the path at the frequency of the sweep voltage. This results in a steady visual pattern of the input signal on the screen of the CRO. It must be noted here that the sweep frequency must be constant to commence the trace from the same starting point in every cycle of the input voltage. To achieve this a pulse called the trigger pulse is produced from the input to the vertical amplifier. This trigger pulse starts the sweep generator, to commence the horizontal sweep.